There is little that can get me out of bed before 8 a.m., but the 2016 Oscar nominations, which required I set my alarm for a cool 3:30 a.m., is certainly something worth springing out of bed for. Though it's still pitch black when I hop in my car and set my GPS towards Beverly Hills, the usually congested roads are a breeze. A nice consolation prize to the early morning wake up call. Arriving at the Academy's Samuel Goldwyn Theater, members of the press and I groggily set up our equipment. I find a seat among the plush red seats and mentally scold the theater's no food or drinks policy, because damn — I sure could use a cup of coffee. 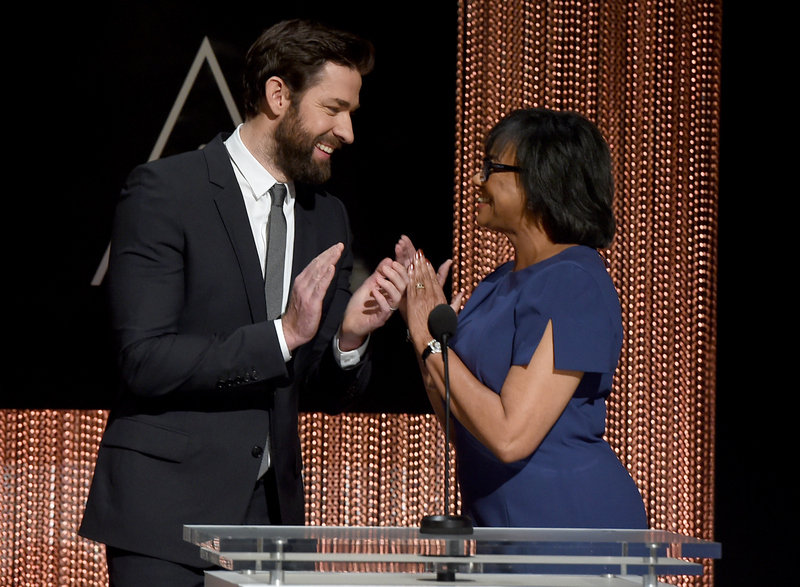 Fast forward an hour or so later and the 2016 Academy Award nominations have been announced, courtesy of John Krasinski, Ang Lee, Guillermo del Toro, and Academy President Cheryl Boone Isaacs. The wait is finally over. Audiences now know which movies they'll need to catch up on in the six weeks leading up to the live award show airing live on Sunday, Feb. 28, but they don't know everything. There are some things that went down behind the scenes of the 2016 Academy Award nomination announcement in Beverly Hills that you didn't see on the live broadcast — and here are nine of them. Let's get the obvious out of the way. It's 5 a.m. in Los Angeles, and everyone here yawned their butts off, including me. Luckily the announcers didn't seemed phased by the early start time, and delivered the nominations for each category with ease and accuracy. The Academy was kind enough to provide breakfast and beverages for those who came early — that is, before 4:30 a.m. Like I said, the theater doesn't allow food or drink inside, so reporters stood outside and chugged their caffeinated beverages before climbing the stairs into the famed Academy theater. It appeared that some reporters seemingly rolled out of bed, threw on a pair of shoes and showed up to get this thing over with. Others wore full suit and ties, or dresses and heels paired with a full face of makeup. Luckily the nominations didn't provide a dress code for journalists, unlike the actual award ceremony that requires men to wear suits and women to wear shin-length dresses or longer. After their job announcing the first half of nominations was complete, the two directors stepped out of the camera's view and gave one another a solid side hug. Perhaps they were both relieved they got through the list of names without mispronouncing a single one. Well done, gentlemen. The two time Oscar-winning director — behind such films as Brokeback Mountain and Life of Pi — had a fat grin on his face as he was led out of the theater after his presenting duties. He walked right past my seat in his crisp grey suit, and I gave him a smile and a nod. Eyeing the room full of journalists, I noticed a handful of men and women I only recognized from their small Twitter avatars. It's funny how a small picture the size of the thumbnail can reveal so much information. I even recognized a dude who was wearing the same shirt he wears in his Twitter photo. Does he wear the same outfit everyday? Deep thoughts before the sunrises. When I rolled up to park, when I walked through the door, when I sat down in the theater, and as I exited the building, men in black suits and stiff posture had their watchful eye on me, and everyone else. The Oscars don't mess around, folks. While reporters were buzzing about their predictions of who might get nominated, how much sleep they got the night before, and what screenings they were attending this week, they also spoke with fondness and affection for the late Alan Rickman, who passed away at the age of 69. News of his death came the same morning as the nominations. At least, he seemed tall when he posed for photos with his fellow announcers — Ang Lee, Guillermo del Toro, and Academy President Cheryl Boone Isaacs — after the nomination announcements had wrapped. All the announcers were grinning as a photographer snapped photos, but Krasinski's bearded grin lived about a foot above everyone else's smile. The 88th annual Academy Awards will be broadcast live on Feb. 28 on ABC.